of heavy use. They have a special way of inciting excitement and enthusiasm in their owners. Adding a splash of color via airbrush, resin tints, or paint pens can really make a board pop and give it personality. 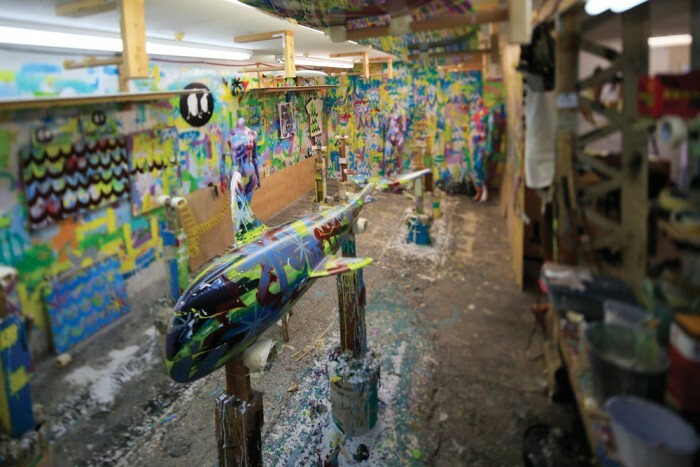 One company that ingeniously merges board building with art is Two Crows Surfboards. Their boards are easily distinguishable by bright and charismatic resin tints and paint pen drawings. The man behind these beautiful pieces of functional art is Welzie. Freesurf picked his brain to gain insight about how he creates these works of art and where the inspiration stems. The art on your boards is quite distinguishable and unique from other brands. How would you describe or characterize your artistic style? Freestyle. It originally came from improvising color work, adding color here and there to give the boards an individual composition. Over time it grew organically to become its own distinctive style. Generally the colors are bold, bright, happy and fun. Can you describe the technique involved in how you apply art to your boards? Are you doing a lot of work with resin tints, paint pens, or something else? Over the years the techniques have changed and the style has developed. We’re always looking for new ways to improve quality and craftsmanship. Resin pigments, tints and paint pens are the backbone of the toolbox, but anything you can paint with is welcome in our shop. We’re always looking for new ideas to keep it fun. Where do you draw inspiration from in your artwork? Is there anything particular that influences you or inspires you? Ideas and inspiration come from my daily life, cruising and having adventures with my buddies. Every day brings something new and I like to create from that. Besides just applying art to boards are there any other art projects you have worked on? The art has grown from the boards to the walls of galleries. It is still made just like a surfboard and goes through our shop side by side with the boards. 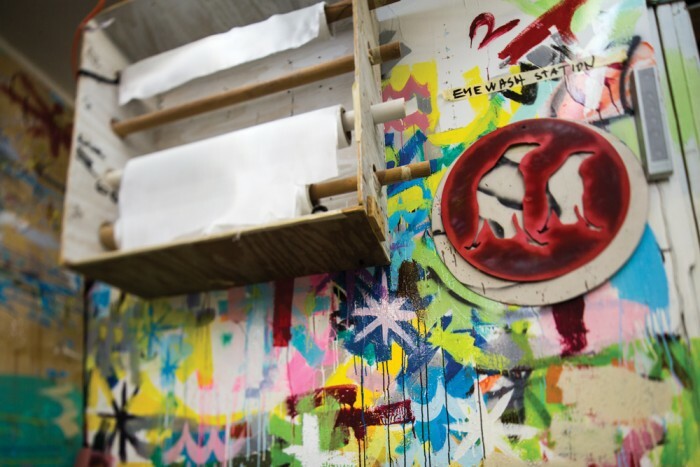 There’s always a new project at the shop – sculptures, mannequins, screen printing… things never get boring. I also like to paint murals and doodle writing in my spare time. What came first, love for surfing or love for art? Art for sure. Building forts and getting in trouble for doodling on the walls was my priority until my dad pushed me into that first wave. Since then I’ve always tried to combine both into one passion. To me though, they’ve always gone hand in hand. Are there any other surf brands that put art on their boards that you think is cool or interesting? I think happy accidents are the spark to creativity and kids seem to make the most mistakes. I’m always stoked to see the way young backyard board builders are approaching the traditional techniques. How do you see your art evolving into the future? Do you try to stay true to what you’re already known for or are you experimenting with new styles, techniques, and materials? It’s always evolving, trying to make it bigger and better. We do a lot of experimenting at our shop, trying new materials and techniques that can be applied to different surfaces or structures. There is no shortage of ideas and projects. Everyday feels like the first day of school, there is so much to learn, I’m just getting started.